Women were first admitted to the New Zealand Police Force as temporary constables in 1941. They did not wear uniforms, and their duties were geared towards women and children. 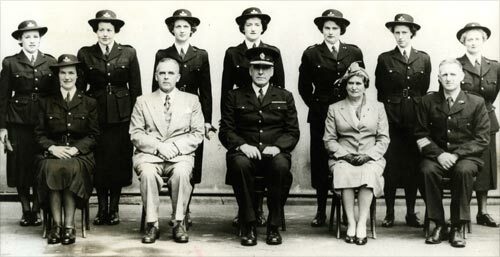 In 1952 eight of these were selected to pioneer the uniforming of policewomen, and they are shown here in this photograph taken at the completion of their training. Pictured are: (back row, left to right) constables Barbara Halcrow, Leanore Lawrence, Lorna Pedersen, Maureen White, Ngaire Lankow, Pamela Lambie and Edna Pearce, and (front row, left to right) Constable Pat Law, Minister in Charge of the Police W. H. Fortune, Superintendent P. Munro, Minister for the Welfare of Women and Children Hilda Ross and instructor Sergeant George Claridge. Policewomen were paid less than their male colleagues until 1966.